Mascagni’s Cavalleria rusticana and Leoncavallo’s Pagliacci each have prominent roles for the chorus. Both composers marshal the chorus to give each opera a strong sense of community, used to powerful dramatic effect. In so doing, they follow a tradition used by the greatest of operatic composers. Communities in opera often represent the oppressed majority in a corrupt regime. In Musorgsky’s Boris Godunov, the Tsar’s bullying officials control the Russian people. By Part IV the people have descended into poverty-stricken wretchedness – a communal mirror for Boris’s personal agony. In Verdi’s Don Carlo, Philip II and his tyrannical Grand Inquisitor have near-total control over the Spanish people, easily suppressing the attempt at rebellion led by Carlo at the end of Act III. Janáček’s From the House of the Dead, set in a Siberian prison camp, movingly depicts the prisoners’ communal suffering, as impassioned monologues from individuals stand out against the chorus’s predominant mood of stoical resignation. 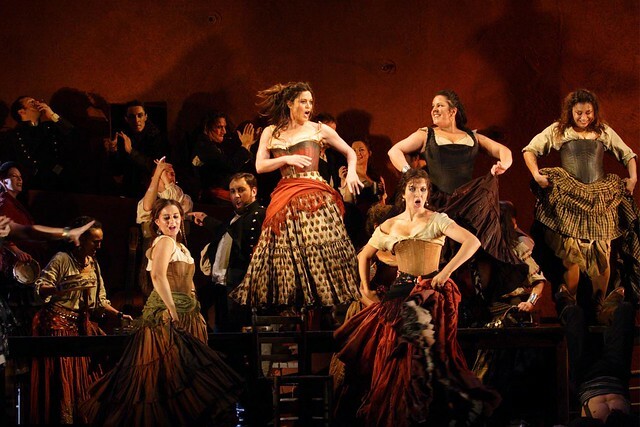 Operatic communities can also be threatening or moralistic. In Scene 4 of Tchaikovsky’s Eugene Onegin, Madame Larina’s gossiping guests help to provoke a fight between Onegin and Lensky. Morality becomes even more menacing in Janáček’s Jenůfa, where the same villagers who celebrate drunkenly with lad-about-town Števa Buryja swiftly accuse his former lover Jenůfa of infanticide. Conventional group morality often highlights the misery of unconventional individuals: Tannhäuser’s longing for forgiveness contrasts with the condemnatory attitude of the Wartburg people, while Britten’s Peter Grimes will never fit into the Borough – as his failure to join in the communal song at the end of Act I shows – and eventually becomes the victim of a savage manhunt. Friction between contrasting communities makes for great drama. Verdi’s Il trovatore sets Count di Luna’s straitlaced soldiers, with their chorus ‘Squilli, echeggi la tromba guerriera’, against the more colourful gypsy community with their lively ‘Anvil Chorus’. In Act I of Les Vêpres siciliennes, Verdi invites us to sympathize with the oppressed Sicilians by contrasting their ardent invocation of freedom with the French soldiers’ bullying martial music. Bizet had fun with several different communities in Carmen: law-abiding soldiers, seductive cigarette girls, rambunctious urchins and freedom-loving gypsies. And in Andrea Chénier, Giordano powerfully depicts the changes wrought by the French Revolution as the aristocratic minuets and quadrilles of Act I swiftly give way to revolutionary songs. Communities can also evoke a sense of joyful ebullience. Bizet uses this to brilliant effect at the start of Act IV of Carmen, as the people of Seville eagerly hurry to the bullfight. So does Puccini in Act II of La bohème, which perfectly captures the bustle and excitement of Paris on Christmas Eve. Perhaps the greatest expression of communal joy comes in Act III of Die Meistersinger von Nürnberg, where processions, dances, Lutheran hymn and a jubilant final chorus build to a radiantly positive representation of community. Mascagni and Leoncavallo also take an optimistic – if less exuberant – attitude to communities. In Cavalleria rusticana, the village community is hard-working and devout – but it also has a sense of fun, as we see in the villagers’ riotous drinking song. The people are also loyal, and support Mamma Lucia during her son’s deadly duel. In Pagliacci, Leoncavallo touchingly conveys his villagers’ innocent enthusiasm, from their excited opening chorus welcoming the actors to their enjoyment of the Act II play – where they believe that the terrible drama unfolding on stage is just good acting. The village communities in these two operas are essentially benign and straightforward – which makes the principal characters’ wild passions and desperate actions all the more emotionally potent. Don Carlo runs 12–29 May 2017. Tickets are open to Friends on 7 December 2016. General tickets will be available on 24 January 2017.